To coincide with the imminent release of Dredd 3D, I’m writing a series of blog posts about what I love about the Judge Dredd comic series. The A-Z of Judge Dredd is not intended to be an exhaustive encyclopaedia, but rather a personal reflection on the main themes of the strip. …and the Angel Gang, and America. …and Banzai Battalion, Batman and Oola Blint. Note: I’m skipping the letters I have less interesting things to say about until the end to ensure I don’t get demotivated. I’ll get back to the rest later. I intend to finish the series by the time the film is released in the US (7 21 September). Wish me luck! I blatantly failed to complete my A-Z in time for the release of Dredd 3D but I’ll hopefully complete it soon. Judge Dredd: The Mega-History (Colin M. Jarman and Peter Acton, Lennard Publishing, 1995, ISBN 1-85291-128-X). An excellent account of the early and often painful development of the Judge Dredd strip. Thrill Power Overload: Thirty Years of 2000AD (David Bishop, Rebellion Development, 2007, ISBN 1-905437-22-6). 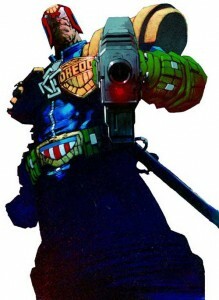 The ultimate account of 2000AD’s history. The Judge Dredd entries on Wikipedia, unsurprisingly. BARNEY, originally the central part of the official 2000AD website, BARNEY is an indispensable resource of every 2000AD prog, Judge Dredd Megazine, reprint and spin-off.